Takes the Shock out of Electrical Testing and Tagging. The purpose of this database is to allow you to record details of various assets such as electrical items - electrical tools, office equipment, kitchen appliances - as well as items such as furniture, vehicles, etc. Against these various items can be recorded scheduled and completed maintenance such as electrical testing and tagging, as well as loan management details. Provides documentation for safety compliance regulations. Enhances compliance and risk management. Reduces stress on management and administration. Saves time by keeping information in one central location. Reminders for retesting and other compliance procedures. Centralised storage of asset details. The ability to schedule upcoming asset maintenance. Associated storage of maintenance histories. The ability to schedule upcoming asset loans. Associated storage of loan histories. 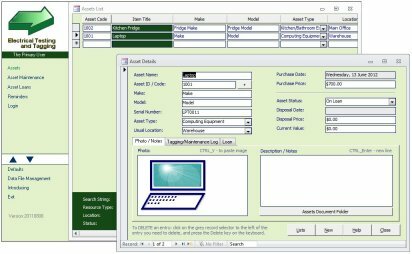 The ability to report on assets by location and/or type. Insert information into compliance documentation. Link into email applications as an enhancement to the reminder system. Forward maintenance and testing dates to a scheduling software package. Maintain financial information and a depreciation schedule. Expand into a larger database system.